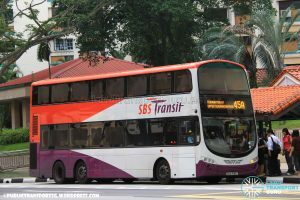 SBS Transit Bus Service 45 is a trunk service plying between Upper East Coast and Ang Mo Kio Depot, passing through Bedok, Eunos, Lor Ah Soo, Serangoon, Ang Mo Kio and Yio Chu Kang. 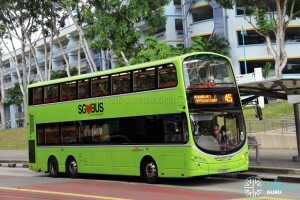 Introduced in 2006, Service 45 is an inter-town route connecting the residential towns of Yio Chu Kang, Ang Mo Kio, Serangoon, Lor Ah Soo, Bedok North and Upper East Coast. Much of its demand arises during the peak hours, as many commute to industrial areas near Ubi and Kaki Bukit. 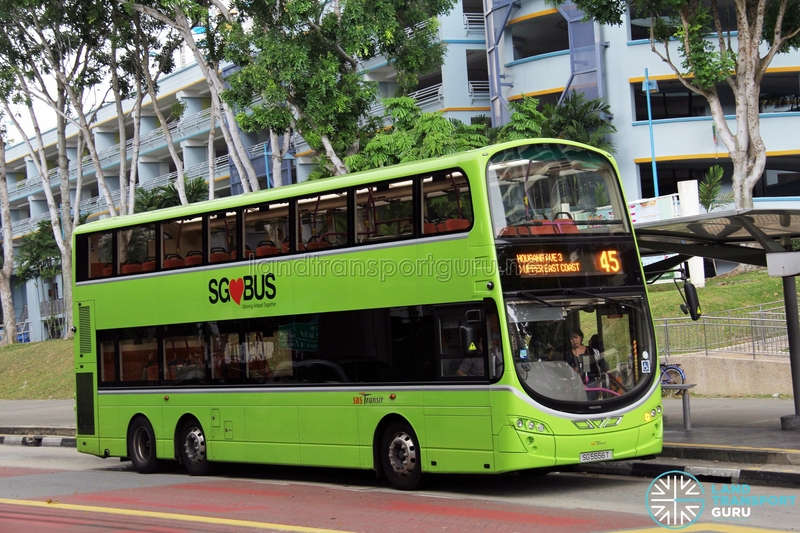 This route links residents of Ang Mo Kio Avenue 10 with Yio Chu Kang and Serangoon MRT stations. 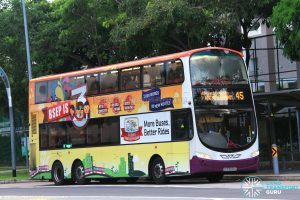 High demand between Serangoon MRT and Lorong Ah Soo results in the deployment of Short Trip Service 45A during AM Peak hours, and it serves alongside Service 53 and its route variant 53M. . This route also supplements Bedok North and Bedok Road with connections to Tanah Merah MRT in addition to services 17 and 14 respectively. 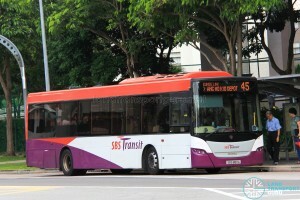 Service 45 plies a short express sector along the PIE between Jln Eunos and Bedok North Rd, along with Express 854e. 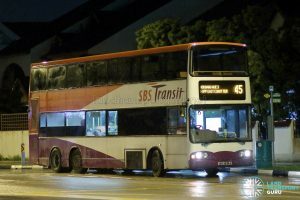 It is also one of four services to terminate at SBS Transit’s Ang Mo Kio Depot. Fare: Charges basic distance fares. See Bus Fares. 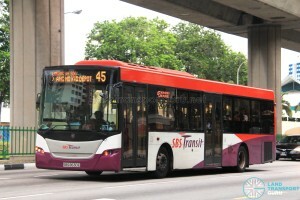 Service 45 at a glance. Click for larger image. 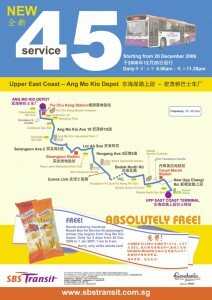 2006 (26 Dec): Introduced between Upp East Coast Ter & Ang Mo Kio Depot. 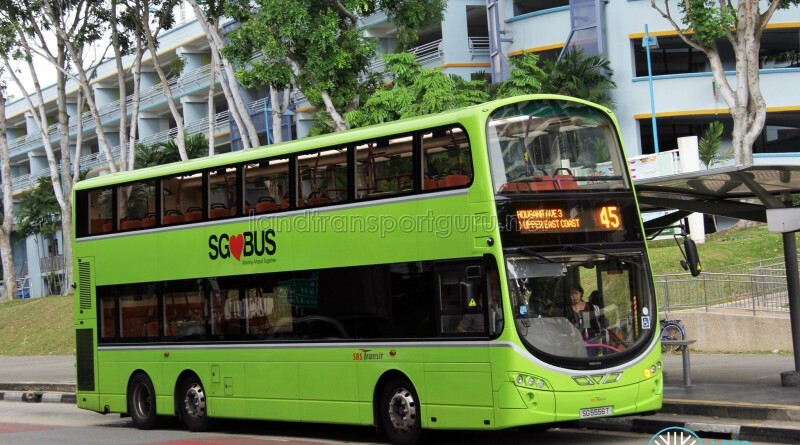 Via Ang Mo Kio Ave 10, Serangoon Ave 2, Lor Ah Soo, Jln Eunos & Bedok North Rd. 2006: Amended to present routing. No significant route changes since 2006.